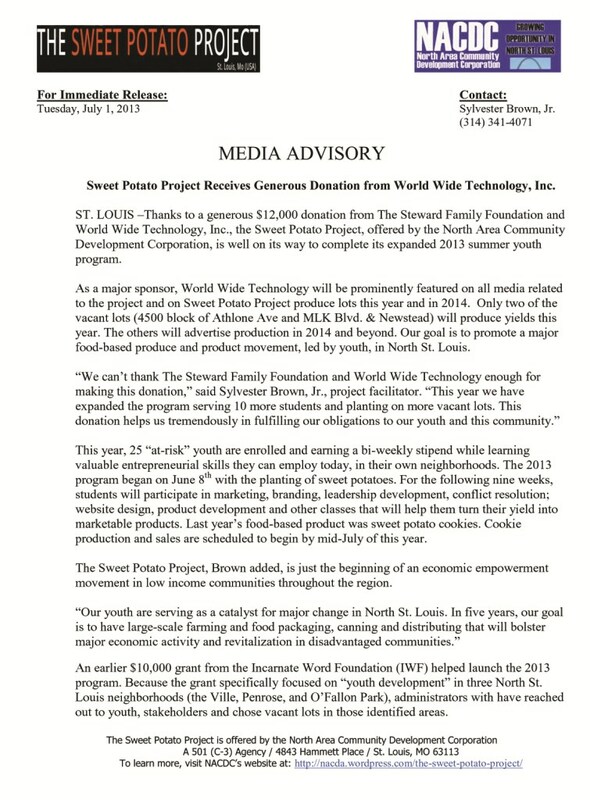 Sweet Potato Project Receives Generous Donations from World Wide Technology Foundation and the Steward Family Foundation. 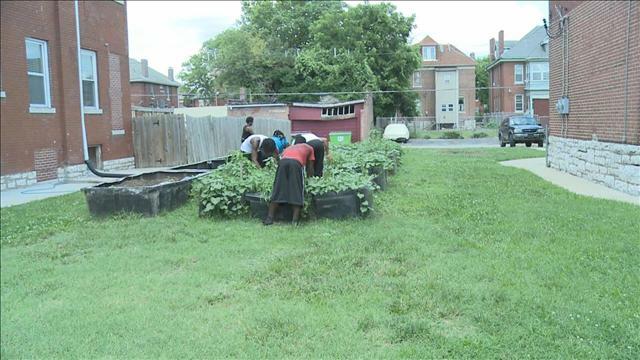 ST. LOUIS –Thanks to a combined donation of $15,000 from World Wide Technology and the Steward Family Foundations, the Sweet Potato Project (SPP), a program operated by the North Area Community Development Corporation (NACDC), is well on its way to meeting its expanded 2014 goals. As a major sponsor, World Wide Technology will be prominently featured on media related to the project and on SPP lot signage. This year, SPP is expanding its program and growing potential by leasing and purchasing vacant lots starting in the Greater Ville area of North St. Louis. Additionally, SPP is working with the nonprofit Gateway Greening asking that some of its member gardeners and public schools grow sweet potatoes that SPP will buy in the fall. This produce will be used to develop more sweet potato-based products. “We can’t thank The Steward Family Foundation and the World Wide Technology Foundation enough for making this donation,” said Sylvester Brown, Jr., SPP’s executive director. “This donation helps us tremendously in fulfilling our obligation to our youth and our community. We plan to recruit more at-risk students (35 total) this year and plant on more vacant city lots. We’re now closer to meeting our goal of inspiring young urban entrepreneurs and developing a major produce and food-based product system in North St. Louis. The 2014 program will officially begin in late May with the planting of sweet potatoes on newly acquired lots. The following ten weeks, students will participate in marketing, branding, leadership development, conflict resolution; website design, product development and other classes that will help them turn their yield into marketable products. The program’s food-based product sold so far has been two varieties of sweet potato cookies made with help and supervision of St. Louis University’s Department of Dietetics & Nutrition. 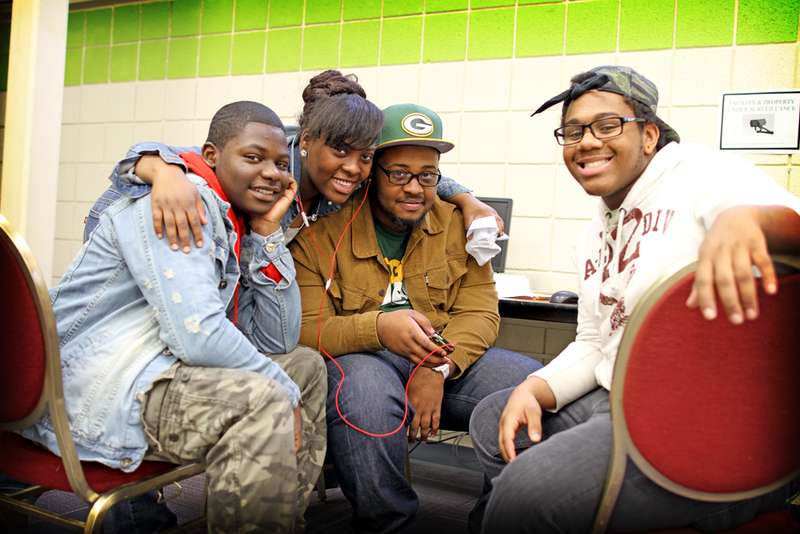 ST. LOUIS-During the Fall of 2013, Saint Louis University’s Department of Communication’s Community Production Group (CPG) chose the Sweet Potato Project as a nonprofit in need of its creative services. Under the direction of Dr. Mary Gould’s undergraduate “Digital Storytelling” class the Sweet Potato Project’s website was given a complete makeover, with a new logo and a host of other user-friendly multimedia upgrades. The class also developed two videos (see links below) designed to better deliver the nonprofit’s mission and to recruit volunteers and donors. “I am totally humbled by the passion and expertise Dr. Gould’s class brought to our project,” said Sylvester Brown, Jr., director of the Sweet Potato Project. “We would have had to spend thousands of dollars-which we don’t have-to gain these types of professional services. We are hugely indebted to Dr. Gould and St. Louis University. The Sweet Potato Project is a program, operated by the North Area Community Development Corporation. The program teaches inner-city “at-risk” youth alternative and progressive ways to produce and distribute locally grown products as well as sustainable business and entrepreneurial skills that can change their lives and enhance their careers. For more information about the Sweet Potato Project or to view the new design created by St. Louis University’s Community Production Group visit: www.sweetpotatoprojectstl.org. 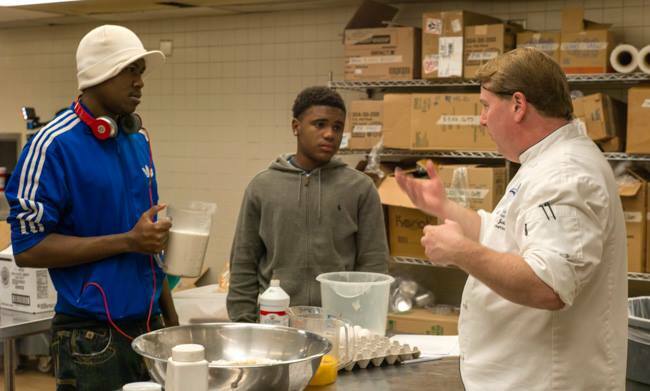 ST. LOUIS – Thanks to a unique partnership with Saint Louis University’s nationally recognized department of nutrition and dietetics, disadvantaged students with the Sweet Potato Project will have an opportunity to receive entrepreneurial tutoring while meeting their goal of producing and distributing a food-based product (sweet potato cookies) made from the sweet potatoes they’ve planted in the summer. 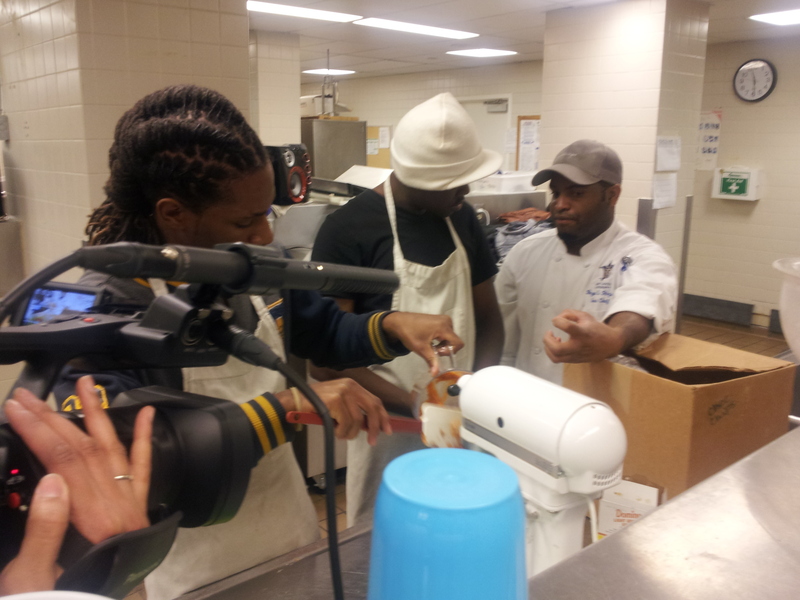 Sylvester Brown, Jr., director of the Sweet Potato Project, credits Chef Steve Jenkins, Assistant Professor and director of SLU’s Food Innovation and Entrepreneurship program, for reaching out to discuss the educational and food production possibilities available through his program. The partnership was given the green light by the chair of the department of Nutrition and Dietetics, Mildred Mattfeldt-Beman, Ph.D., at Saint Louis University’s Doisy College of Health Sciences. The department of Nutrition and Dietetics offers one of the nation’s first undergraduate programs that combine the scientific principles of dietetics with the arts of food processing and culinary entrepreneurship. Mattfeldt-Beman is the founder of the Gardens to Tables program that provides nutritious and sustainable grown food, nutrition education and hands-on gardening opportunities to public school students. The Sweet Potato Project is in line with Mattfeldt-Beman and SLU’s commitment to promoting sustainable agricultural practices throughout the region and especially in economically disadvantaged areas of the city where access to fresh food can be challenging, Jenkins said. This Saturday, Oct. 12, students will harvest their sweet potatoes that will be transported to the Salus Center on SLU’s Medical Center side of campus. The following Saturday, Oct.19, students from the Sweet Potato Project will be in the Food Innovation Center, a teaching kitchen in the Salus Center, baking and packaging their sweet potato cookies under Jenkins’ guidance and supervision. For more information about the Sweet Potato Project please visit our website: sweetpotatoprojectstl.org or call Sylvester Brown at 314-341-4071. For more information on SLU’s nutrition and dietetics curriculum, as well as its community programs, visit the department’s Web site at nd.slu.edu, or call 314. 977.8523. Being an entrepreneur takes more than just having what you think is a “good product.” It takes marketing, development, being social, and most importantly, mentorship. And, you have to be willing to build it from the ground up. But where do you start? For Sylvester Brown, you go with something that’s plain and simple: sweet potatoes. “Sweet potatoes, I’ve eaten them all my life. Once I found out that the sweet potato is related to the yam, which comes from Africa, I thought ‘Oh, here’s a nice cultural tidbit that I can help the kids also – I can drop in some history. Where they came from, their legacy, what they’re about,” he says. Born and raised in St. Louis, the former St. Louis Post-Dispatch reporter came up with the idea for The Sweet Potato Project a few years ago after he spent time working with Smiley Books, which is owned by radio host and writer Tavis Smiley. He became plugged in to the idea of the “black agenda,” which included bringing back disadvantaged neighborhoods through community involvement. He realized that it was up to his own community to figure out how to raise strong leaders and empower itself, rather than waiting on a handout. “It moved me to a point to where I had to do something. So I thought, ‘Well, I couldn’t do anything national but I could darn well do something locally, and I can darn well do it with a few kids.’ I made it really simple – ‘We’re going to plant, we’re going to turn the produce into a product’ – and people started to get it,” he says. He began by partnering with the North Area Community Development Corporation to raise funds, and reached out to teens from low-income backgrounds to be part of the first class. Last summer, the 15 students planted their crop on land provided by Alderman Antonio French, and spent eight weeks listening to speakers, taking field trips – and prepared to sell their sweet potato cookies that eventually resulted from their yield. This year, the project increased its fundraising efforts, and received grants from the Incarnate Word Foundation and World Wide Technologies. They extended the program to nine weeks and expanded to another lot in The Ville owned by Alderman Samuel Moore. The sweet potatoes can take care of themselves once they are planted, but do need an occasional weeding. It’s something that 19 year-old Charnel Hurn and her fellow coworkers don’t mind doing after class, like they were on a mid-August Thursday. “A lot of programs may teach you how to play basketball, or teach you how to cook – but we circle around everything – how to be a better person, how to cook, how to plant, entrepreneurship. It teaches us everything. It’s like a variety of things that we’re learning all at one time in the little bit of time that we have,” she says. Hurn participated in the project last year and is overseeing the cooking team. She says that the program has shown a lot of progress– their bi-weekly stipend has improved, there are more field trips and more teens are involved. That includes 19-year-old Jason Fitzpatrick, who heard about the sweet potato project from his stepdad, who thought it would be a better alternative than just hanging out this summer. Now that the summer is winding down and the potatoes are almost ready to be picked, Sylvester Brown sees this as just the beginning. After the harvest, expect to see more cookies, which will be sold around town this fall. ST. LOUIS (KSDK) – Former St. Louis Post-Dispatch columnist Sylvester Brown grew up on mean streets of north St. Louis, neighborhoods where drug dealing is often the definition of being an entrepreneur. He understands that growing up in an environment where crime and drugs are everyday life can cause a young person to believe that’s all there is. Mentors helped him when he was younger, and now he wants to pay it forward. “I’m able to take young people who were raised in the same environment I was raised in when I was a kid and say ‘you’ve got something special, here’s the resource, here is the opportunity,” said Brown. 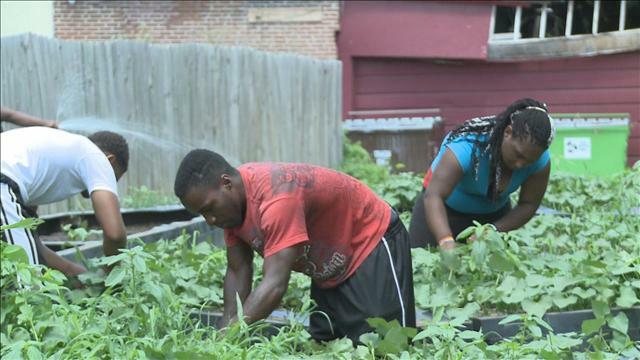 Thanks to Brown, something’s growing in a vacant lot in north St. Louis: sweet potato vines and the teenagers who planted them. Brown wants Hurn and the other 24 students taking part in the Sweet Potato Project to understand they can determine their own destiny by starting their own businesses. “The idea was just to turn on that light bulb and get them to understand that opportunity is right outside your door,” said Brown. In 2009, shortly before Sylvester Brown was let go by the Post-Dispatch, he re-read a column that he wrote about helping inner city teenagers succeed. It was a call to action for other people. Ultimately, Brown took action of his own and created the Sweet Potato Project. “We will create jobs and businesses and opportunity in our communities and this is been missing for a long time in low income African-American and Latino communities. How do we generate money? The best way to generate money is to do for self. Teach kids at a young age how they can always generate money, create products, create ideas,” said Brown. While the sweet potatoes grow, the students attend daily classes, learning about leadership, teamwork and business creation. They also spend time watering and weeding the potato vines. The product is sweet potato cookies sold online, with the proceeds funding the Sweet Potato Project. “My goal here is to have these kids become the next generation of pioneers who bring community, economic activity back to the community,” said Brown. Brown hopes that cookies aren’t the only by-product of the sweet potato project. He believes he can change lives and attitudes. “Our kids know how they are perceived. They know how people look at them. They know that they are stereotyped,” he said. “All you hear on the news is black people getting killed, black people going to jail, black people getting life, and I don’t want to be one of those people,” said Williams. The Steward Foundation and World Wide Technology recently donated $12,000 to the Sweet Potato Project. The money will come in handy since 20 students were turned down for the program this year because of funding. Besides donations, Brown is asking for volunteers and local business owners to mentor his students. For more information about the Sweet Potato Project. A slightly more unconventional role for the sweet potato these days is keeping kids off the streets. St. Louis’ violent crime rate is 332 percent higher than the national average. Homicides in the city have seen a 36.4 percent increase in one year. According to the St. Louis Post-Dispatch, 9 out of 10 homicides involve black youth. Of those killed, half are black males under the age of 30. Every year, more than 300,000 school-age children across the nation, mostly black and brown, are introduced to the criminal justice system by way of “zero tolerance” policies. In Missouri, almost 50,000 youth are retained every year in some sort of correctional setting. Since the 1970s, the state and federal prison inmate population has spiked some 700 percent with a total of more than 2 million incarcerated individuals-again, mostly blacks and Latinos. We are all familiar with the toxic connection between poverty and prisons. While the poverty rate for white and Asian children hovers around 21.6 percent, it’s almost 40 percent for black children and 32.3 percent for Hispanic youth.